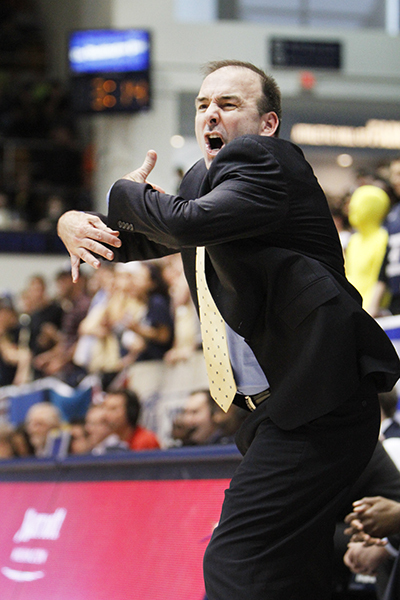 Mike Lonergan is known for his energy on the sideline. GW rewarded Mike Lonergan with a contract extension through the 2020-21 season Friday after the head coach led the Colonials this month to their first NCAA Tournament in seven years. Athletics director Patrick Nero declined to disclose the financial terms of the contract, but said Lonergan had two years left on his original five-year deal. Nero brought in Lonergan as his first head coach hire shortly after he arrived in 2011, and the two quickly developed plans to put the men’s basketball program on “a new timeline.” After two losing seasons in 2012 and 2013, Lonergan helped shape a team that is gaining stronger recruits, surprising transfers, television exposure and even better academic success. In his third year in Foggy Bottom, Lonergan led the Colonials to an 11-game turnaround – sixth-best in the nation – and to the second most wins (24) in program history. It was a dramatic leap that many thought would’ve earned Lonergan Atlantic 10 Coach of the Year. It didn’t, but a trip to the NCAA Tournament and a hefty contract extension seem like nice consolation prizes – especially as he gets to remain close to home, Lonergan said. The team, which has historically had one of the worst academic records at GW, lifted its cumulative grade point average from 2.2 to 3.0 in just three years. Though the department would not disclose the specific terms of the contract, the new deal is almost certainly a nice pay upgrade for the coach. GW paid former head coach Karl Hobbs nearly $536,000 in total compensation in fiscal year 2010, according to University tax filings. Lonergan’s contract isn’t packed with complex incentives or bonuses, Nero said, but is more “basic” like other GW contracts. That’s never a certainty in college basketball, where mid-major coaches can be scooped up by schools with bigger names and opportune coaching vacancies. Experts and fans had linked Lonergan to potential new job spots at University of Maryland or Boston College. Nicole Auerbach, a college basketball reporter for USA Today, said locking up Lonergan for the long term was a smart move. Nero said during his 25 years in college sports he’s never seen anyone work harder than Lonergan. It wasn’t just the on-court success that warranted the extension, but also the relentless recruiting mindset and the alumni community building Lonergan brings to the table. Lonergan, a Bowie, Md. native, would only leave a program if he felt it had reached its ceiling, he said. At Catholic University – where Lonergan coached from 1992 to 2004 – he felt he had reached the highest peak in Division III basketball. After six years at Vermont, he felt he had reached the highest peak in the uncelebrated American East Conference. At GW, though, Lonergan is part of a rising trajectory. The team’s brand is growing stronger among recruits and fan, meaning “the sky’s the limit at GW,” he said. And no matter who called, Lonergan said, he wasn’t going to leave Foggy Bottom. “There was never any question in my mind,” he said. Now, with the contract out of the way, Lonergan can get back to basketball and back to catching up on recruiting. The team has two scholarship spots open for transfers after two little-used underclassmen decided to leave this week, and he already has a strong five-player Class for 2015. “Now, for maybe the first time in my career, I can honestly tell a kid and his parents, I know it’s a year or two away until he graduates high school, but I’m gonna be here,” Lonergan said. – Sean Hurd and Cory Weinberg contributed to this report.